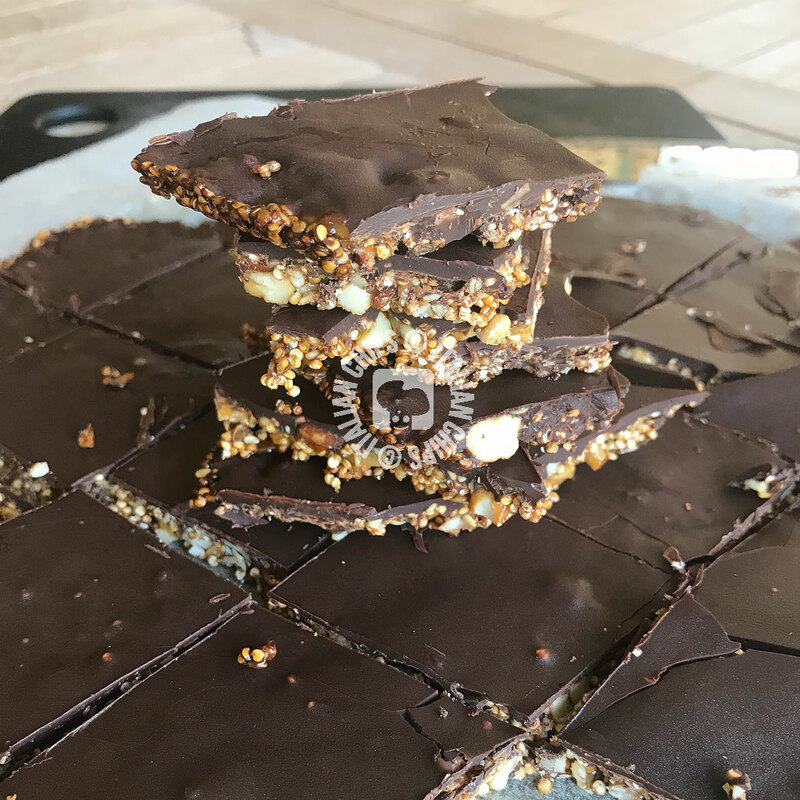 Quinoa and chocolate brittle, what an idea! I had never thinked about a quinoa and chocolate brittle. I eat quinoa regularly, but I had never thought about combining it with sweet ingredients. When I saw this recipe on halfbakedharvest.com, I couldn’t ignore it. As I’ve written in other posts, I only post recipes I really like. The day I tried this recipe I tried 3 other ones. I began with a dried fruits bar covered with chocolate. But it was one of those “no” recipes. Those ones that attach to your food processor container without melting, then to your blender, when you try a thinner container. Nothing to do, I threw it all away. 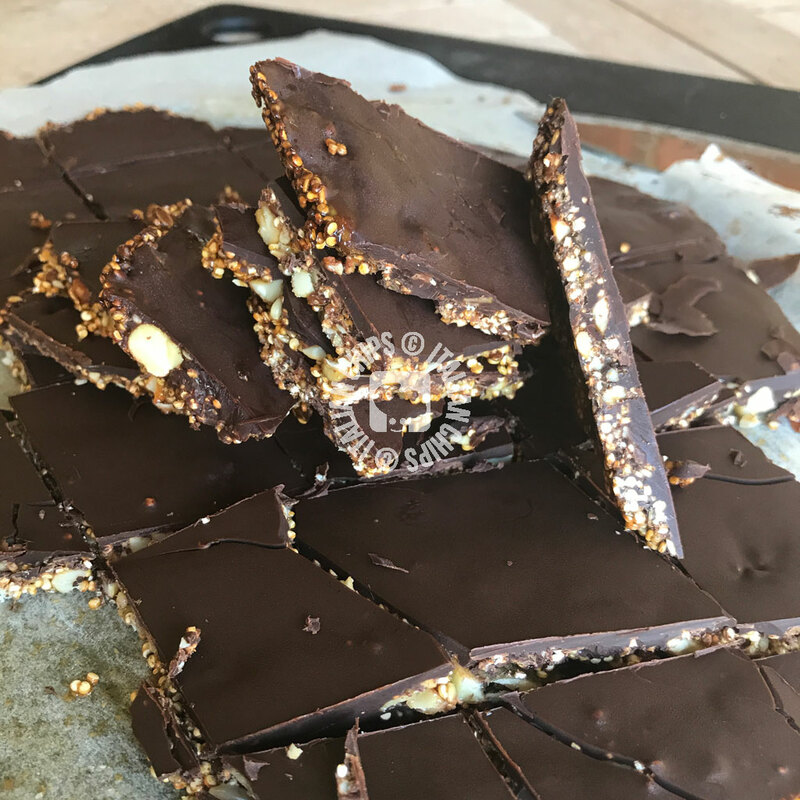 And so, when I began to prepare this quinoa and chocolate brittle I was a little bit skeptical, thinking it was a “no” day. Fortunately I was wrong. This recipe is really simple and has only healthy ingredients. It’s perfect for us when we are trying to keep fit but feel the urge for some sweet treat. It has its calories, but the best kind we can desire. It might be kept in the fridge. I first tried it from the fridge and couldn’t stop eating it. Then I take it out of the fridge to cut and take the pics, and it reached room temperature. It is always good, but MUCH better if cold from the fridge ;-). Turn on the oven 350°F. Cover a flat baking pan with parchment paper. 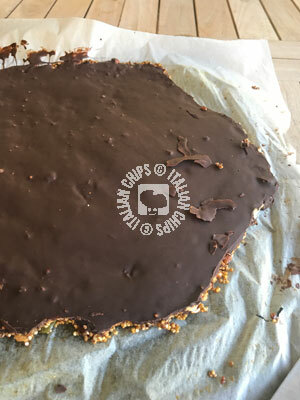 In a pan that can contain, in a second moment, all ingredients (except the chocolate) melt honey with oil and sal. Turn off the gas and add vanilla and coffee. Add quinoa, nuts and seeds and mix well. Pour the mixture onto the baking pan and bake for 20 minutes. In the meanwhile melt the chocolate in bain marie or microwave. 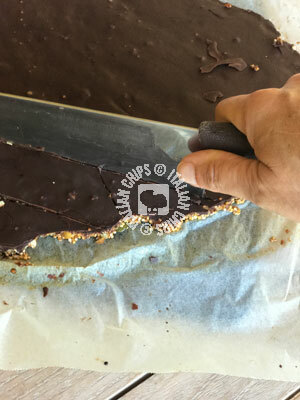 Take the pan out of the oven and spread the chocolate over the brittle. As soon as it cools put into the refrigerator until it solidifies.